Plate with stencil before glazing. Laura Cooke, a talented ceramicist from Asheville, North Carolina and Eva Magill Oliver, now a Greenville local, have teamed up once again to create an incredible collection of ceramics. Cooke shapes the pieces of pottery while Magill Oliver uses original stencils to form the organic shapes glazed on to each one. Each vase, platter and cup are handcrafted with thoughtful care to each artists vision and style. Read below for their joint statement on this collaboration. A selection of works that will be available for purchase. “We have such a respect and love for each other's creations. We wanted to combine the 2D visual art with the ceramic process to create an object of beauty and in tandem serve a function and quotidian purpose. Please join us THIS Friday and Saturday to see and collect these incredible pieces. Saturday from 10 - 4, both Cooke and Magill Oliver will be here to answer questions and chat about their craft. If you are not local, we will have their pieces available through our online pop-up shop Friday and Saturday. For more information and a map to plan out your weekend adventure, click here or stop by the gallery. We will be open this Friday, November 9th from 6pm - 8pm, Saturday, November 10th from 10am - 6pm and Sunday, November 11th from 12pm - 6pm. See you then! This coming Saturday, September 22nd, we will be hosting a one-day pop up event featuring the joint work of Douglas and Meredith Piper! The Piper’s will be here from 10am - 4pm this Saturday with a brand new and exciting body of work. The pieces in this new series are incredibly unique and feature both Meredith’s colorful painted landscape backgrounds and Douglas’s linoleum block prints. See images below for a sneak peek. 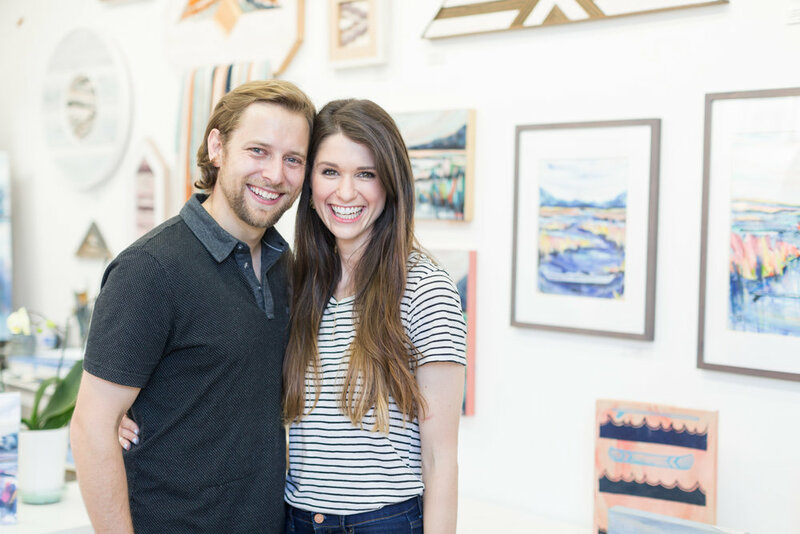 Meredith and Douglas moved from Louisiana back to Douglas’s hometown of Greenville and have since began to truly thrive in their respective artforms. Both Pipers have studio spaces located in the Art Crossing at Riverplace in downtown. It is exciting to see two artists with dramatically different styles come together to create work that both of their hands touch. Feel free to reach out to us with any questions about the pop-up. All work will be released the day of the event. Continuing our series on the three talented artists that spend their days painting in our A&L Studios, we introduce (or re-introduce) Gallery owner and artist, Teresa Roche. We have already covered local talent, Kiah Bellows and the newest addition, Dorothy Shain. You can look back at our blog history to catch more on them. Teresa Roche is the woman behind Art & Light Gallery and has truly helped to shape the Greenville art community with her support of local artists and dreaming big. 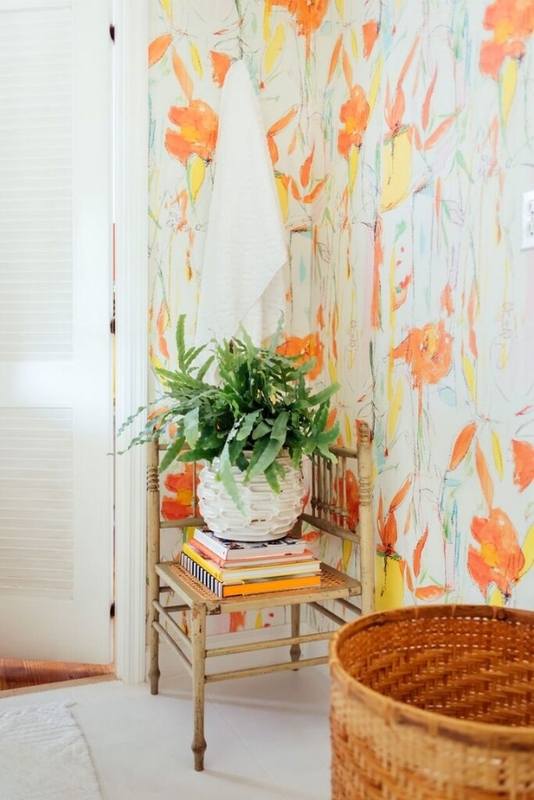 In addition to creating a beautiful gallery space here in the Village of West Greenville, Roche makes her own incredible paintings on paper and panel and with an intense love for pattern design and textiles, Roche has been working toward transforming her works of art into wallpaper and textiles. If you are looking to make a statement with unique patterns and gorgeous color, pop into the gallery or head to Roche's website to see what is available. "Macarena" wallpaper. Designed and styled by Amanda Louise Interiors. Photo by Luke Cleland. This year has also been an exciting year for Roche as she has expanded her gallery representation to our friends at Miller Gallery, in Charleston, SC. Charleston is an exciting art market and both Roche and Bellows will celebrate a joint exhibition this November. Before that, Roche will have pieces available through Miller Gallery at the Affordable Art Fair in New York City, September 27th - 30th! It is always exciting to see talent grow and evolve. If you are interested in keeping up with Teresa and her latest endeavors, let us know. We will add you to her "First Look" list and keep you posted on new works of art and happenings. View of "Dance in Chaos" from the front door of the gallery. Landscapes that inspire, colors that spark something inside of you bringing you back to a comfortable place. Feeling your feet firmly planted on the ground. Something ignites inside, a rush of adrenaline, a little chaos, yet feeling confident and calm. Bringing you back to childlike dreams, sometimes intense with vibrant and captivating color. Bellows and Benjamin are inspired by and find common ground with Wolf Kahn, Richard Diebenkorn, and Brian Rutenberg. Acrylic and Oil Paintings with Intense color, are what the two do best. These Abstract paintings suggest landscapes through an array of horizontal lines and sometimes precise points of interest. We hope they will draw you in and spark something inside leaving you excited and full of wonder. This Friday, September 7th from 6 - 8pm, we will be having an opening reception to celebrate this month-long exhibition. We would love for you to stop by to view the show and shake hands with the talented artists that made the work. Exhibition runs September 7th - September 29th. Pre-sales have started by request and in the gallery and works will be released through our website at 12pm EST September 5th.